I’m a late-comer to Ottolenghi fandom, I had the standard complaints about his books; too many exotic ingredients, pedantic and complicated recipes. This all changed when a friend gave me Jerusalem as a birthday present a few years ago. Middle-Eastern food is my thing, suddenly, the exotic ingredients weren’t so exotic and I didn’t have to google every second ingredient to find out what the hell it was. Sumac, za’artar, tahini, pomegranate molasses were all things I already had in my store cupboard . Suddenly I got Ottolenghi, I simplified, improvised and adapted his recipes, left out ingredients, stuffed up the procedure and it was all delicious. Of course there are still ingredients I’ve never heard of before – barberries, date syrup, black garlic to name a few but some of those exotic ingredients that I’ve cursed Ottolenghi for over the years are actually pretty amazing. I’ve always substituted chilli flakes for Aleppo pepper flakes (how different could they be after all) but a few weeks ago I bought some home and it turns out they are actually pretty awesome (slightly smokey and sweet without the heat of regular chilli flakes) I’m a convert now and use Aleppo pepper flakes on everything from pizza to salad. You shouldn’t question genius. I’ve always stubbornly resisted buying black garlic and barberries but Ottolenghi is always right and I’ll have to track them down and try them now. Ottolenghi is a prolific cookbook writer and as he always seems to have a new cookbook out around my birthday so I’ve acquired quite a collection over the years since my conversion. His latest cookbook ‘Simple’ was a present from my partner this year. 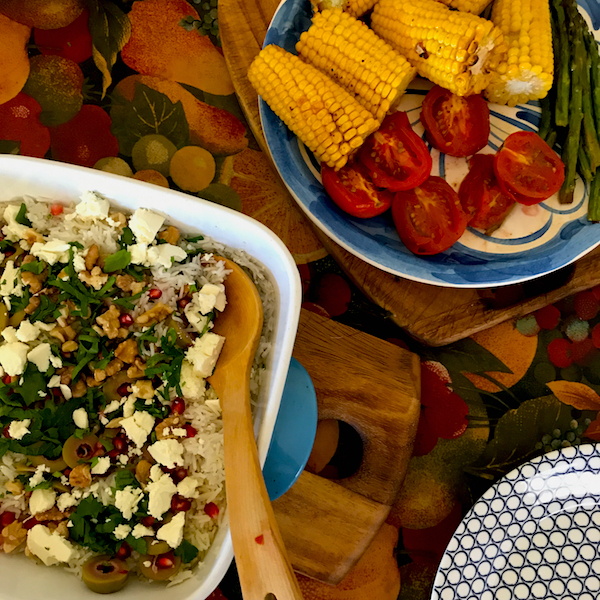 Simplicity, is relative in the Ottolenghi universe but most of the recipes are actually pretty easy, something you can make for a weekday meal or build on for a more elaborate feast. These recipes are like a basic black dress of cooking, something you can dress up or down depending on the occasion. There are a couple recipes for baked rice. One with a slow roasted cherry tomato confit topping, but this one, with an pomegranate and olive salsa, is my favourite – it’s like a warm rice salad. I usually halve the recipe and have it for an easy family meal. You can prepare the salsa a few hours beforehand and simply bake the rice half an hour before dinner and voila, magic happens. While the oven’s on you can roast some veggies – corn, tomatoes asparagus or my latest obsession, mushrooms, baked with a drizzle of olive oil, pomegranate syrup and Aleppo pepper flakes, because if you’ve got rare and exotic ingredients you should use them! Place rice in a high sided baking dish (about 20 X 30cm) throw in the butter, season well with salt and pepper. Pour over the boiling water and stir the butter around so it melts. Top with sprigs of mint, cover dish with tin foil and seal well. Bake for about 25 minutes until rice is tender and fluffy. While rice is cooking make salsa mix together all the ingredients (except mint) with 1/4 teaspoon of salt. Remove rice from oven. Pull leaves off mint, discard stalks and put mint leaves back in rice. Sprinkle feta over rice. Just before serving, add shredded mint to salsa and spoon salsa over rice. Serve warm.